The band releases their new single and video for "One Step Over The Line" today. 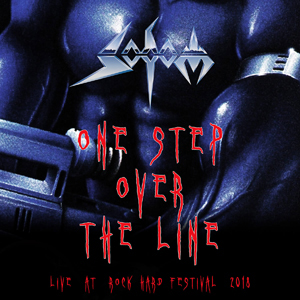 This is a live version from the Rock Hard Festival and the song is the bonus track of the digital version of the new EP Partisan (https://Sodom.lnk.to/partisan ), which will be released on November 23rd also as CD digi and 10" vinyl. Tom Angelripper says: "Germany/Rock Hard Festival 2018 - The starting point for the new line up... after weeks of rehearsing it became true, we headlined the Friday at the legendary Amphitheater in Gelsenkirchen (SODOM's hometown). One title was in our set list that we haven’t played in decades. "One Step Over The Line" is a guarantee for wild headbanging! This hit built our frame for the first live-video with the new line up! SODOM are back with a vengeance!"